Differences in equipment under scrutiny as tolerances tighten. Variation between different manufacturing equipment is becoming increasingly troublesome as chipmakers push to 10/7nm and beyond. Process variation is a well-known phenomenon at advanced nodes. But some of that is actually due to variations in equipment—sometimes the exact same model from the same vendor. Normally this would fall well below the radar of the semiconductor industry. But as tolerances for variation become tighter at advanced nodes, the impact is beginning to spread out to many more companies across the manufacturing ecosystem. From the foundry side—the actual users of equipment—equipment variation always has been a concern. It can affect everything from uptime in a fab to wafer yields, as well as chip performance and post-production reliability of chips. Equipment makers recognize these concerns. Most are working on solutions. But effectively solving this problem requires changes across the entire supply chain because there is no single cause. It is basically a lot of little problems that add up to a much bigger problem, and it includes everything from the purity of gases, the pressure in different etch chambers, to the consistency in power supplies and even the power itself. But across the supply chain, some factors are more obvious than others. This is particularly evident with overlay issues, which have a cumulative effect because they result from multiple steps in the process flow. 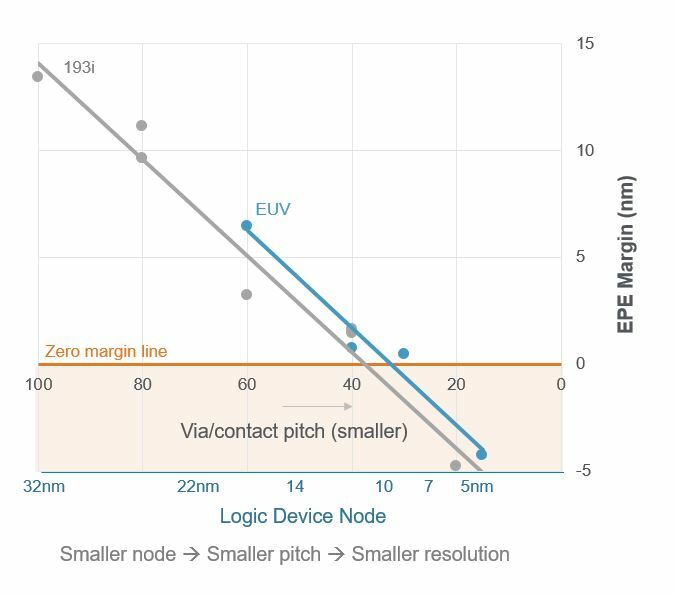 Variation is particularly evident on the lithography side, where one EUV scanner is not necessarily the same as the next—even if they are marketed as identical pieces of equipment. The difference is akin to a manual typewriter, where one key may strike differently on one machine than another even if they were sold as the same model. But at 10/7nm, just one or two nanometers can make a difference. Sturtevant noted that equipment always has been qualified by process and equipment engineers so that when preventive maintenance is required, other equipment can be substituted. Fig. 2: EPE margin shrinks with each node. Source: Applied materials. One idea that seems to be gaining ground is what basically amounts to persistent metrology. It goes under a variety of names. TSMC calls it industrial IoT. In Europe, it falls under the heading of Industry 4.0. By constantly monitoring these systems for changes, variation can be minimized and yield can be increased. There is strong support for this from equipment vendors, in part because it opens up new opportunities for them and in part because it reduces the number of surprises for their customers. Understanding where problems arise requires more than just monitoring the equipment, though. There are so many variables in semiconductor manufacturing that it’s impossible to keep track of all of the aberrations and shifts. One way that companies have dealt with variations—particularly process variation—in the past is through guard-banding. But guard-banding eats up area, and at advanced nodes it has a direct impact on performance and power. The result is that guard-banding can no longer be used to the extent that it has been used in the past, even though the problems it seeks to address are more severe. Advanced packaging adds another wrinkle into all of this, because variability can now happen on multiple levels and across multiple die. The problem is that it’s harder to trace that back to the source of the issue. And finally, solving some of these variability problems will require some new approaches. He noted this also will require greater collaboration across the semiconductor manufacturing ecosystem. That seems to be a growing sentiment in the industry. In this equation, variability is just one factor. But at 10/7nm and beyond, it’s an increasingly important one, and one that potentially can provide significant improvements in yield and scaling benefits if it can be addressed effectively. Computational challenges on the rise with EUV. Scanners are no longer interchangeable. Experts at the table, part 3: EUV, metallization, self-alignment, ALD, and the limits of copper. Good article, Ed. 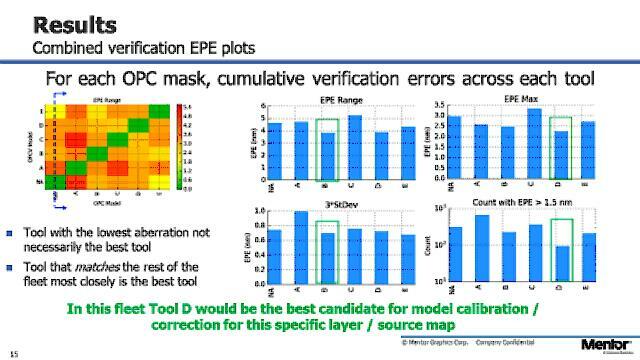 I recently heard of a French startup named “Pollen Metrology ” (www.pollen-metrology.com) that is addressing process variation in the semiconductor industry using image processing, data fusion, and machine learning in one package. Very interesting stuff. Thermal deformation-induced aberrations are the showstopper for EUV. Ed – Thank you for a very well written and easy to read article. While I am not familiar with every detail that you have highlighted, the concept of how data analytics and machine learning can impact what some may consider to be very rudimentary i.e. chamber matching, is appreciated and embraced. As the mirrors in the EUV scanners get hotter, their aberrations can change (get worse). This defies any type of OPC, which is fixed on the mask. So some have proposed the use of EUV mirrors which are active (thermally or piezoelectrically actuated). Of course, these have other issues. He mentioned the EUV lens aberrations varied over time, that could be thermal. However, that can’t be corrected by OPC.